After removing the leaves from the stalk don't need to chop the leaves. Just toss them in the oil for a few minutes and then add water and cook until it turns soft. This keerai poriyal or sambar is prepared on the next day for ekadasi fasting called as thuvadasi. This keerai reduces the body heat. 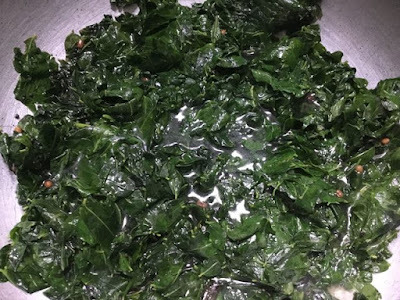 You can also dry the leaves in shade for 2 days and store it in an airtight container. You can add these dried leaves in sambar. 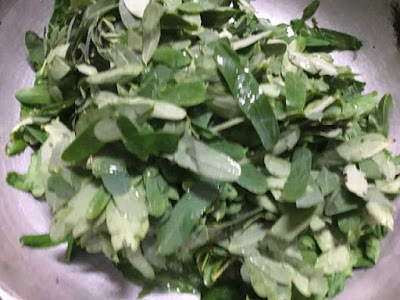 Even though this keerai, has lots of medicinal values you should eat this keerai only once or twice in a month. If you are taking any siddha or auyurveda medicines, avoid this keerai because it will reduce the power of the medicines. Remove the leaves from the stalk and wash the leaves 2 to 3 times in water. 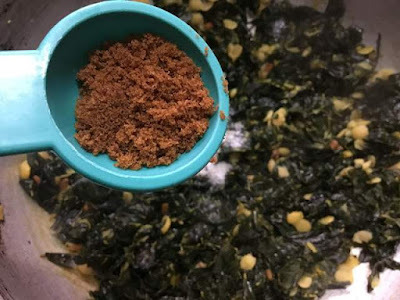 Grind the grated coconut, red chilli, small onions, garlic cloves and cumins coarsely. Pressure cook the toor dal for 3 to 5 whistles and keep it ready. Heat oil in kadai and add the mustard and urid dal. 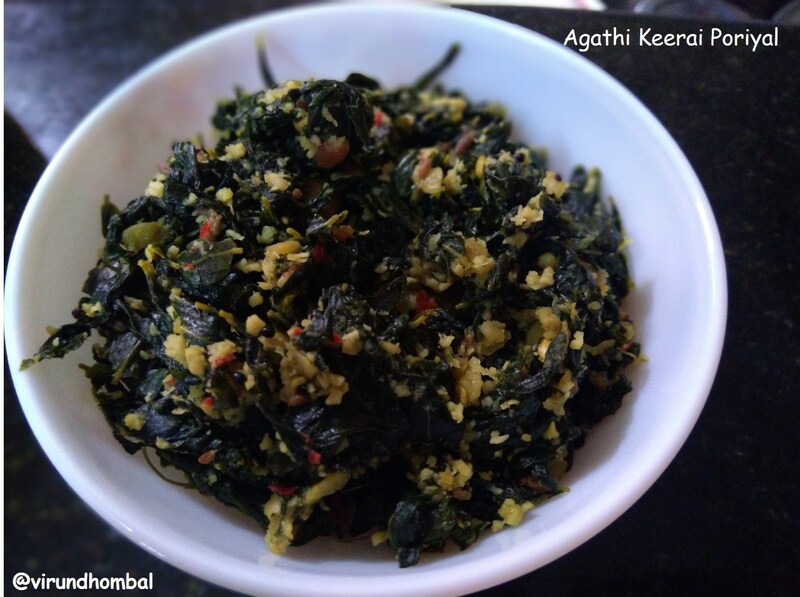 Allow them to crackle and add the agathi keerai leaves and saute it well. When the leaves has wilted, take a handful of water and splash it. Cook the leaves on medium heat. Check in between and again splash some more water and cook.When the leaves are completely done, add the cooked toor dal and turmeric powder. Mix them well. Next, add the required salt and mix them well with the leaves. Now add our magic ingredient powdered jaggery and mix it well. Add the ground coconut mixture and mix it well. 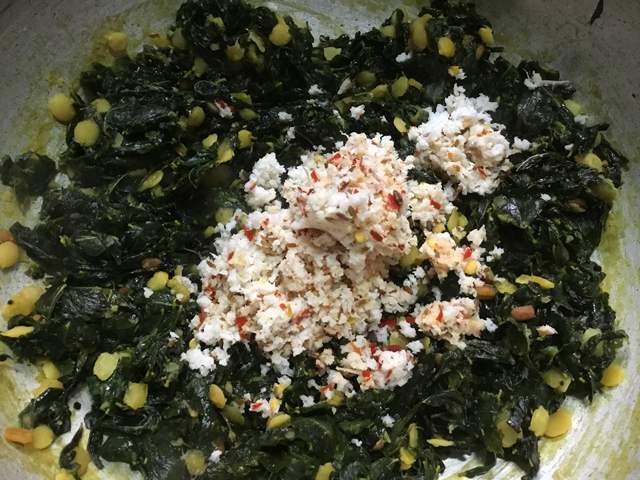 The coconut paste must incorporate well with the leaves. Finally, add the coconut oil and stir it well with the leaves. 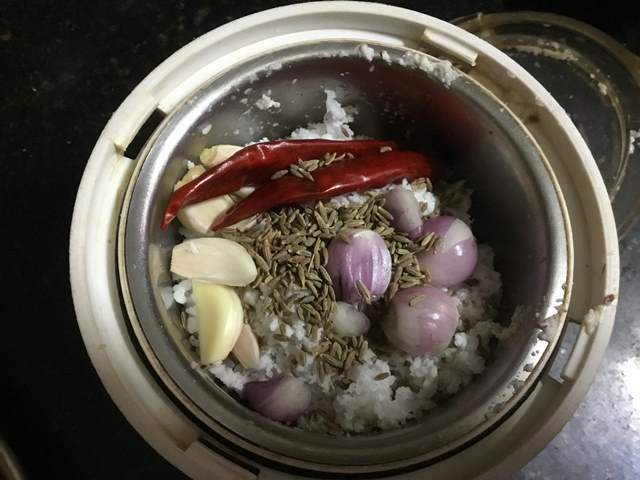 Grind the grated coconut, red chilli, small onions, garlic cloves and cumins corasely. Heat oil in kadai and add the mustard and urid dal. 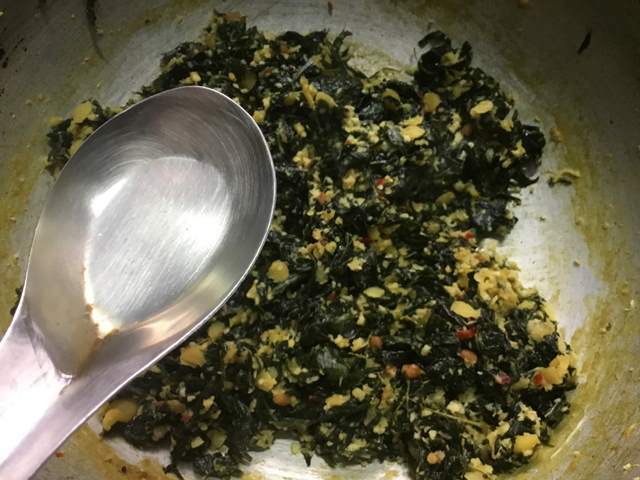 Allow them to crackle and add the agathi keerai leaves and saute it well. You can hear a ushhh sound now. When the leaves has wilted, take a handful of water and splash it. 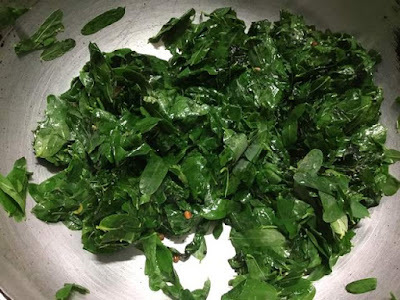 Cook the leaves on medium heat. Check in between and again splash some more water and cook. 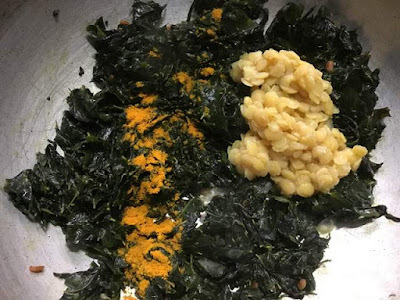 When the leaves are completely done, add the cooked toor dal and turmeric powder. Mix them well. 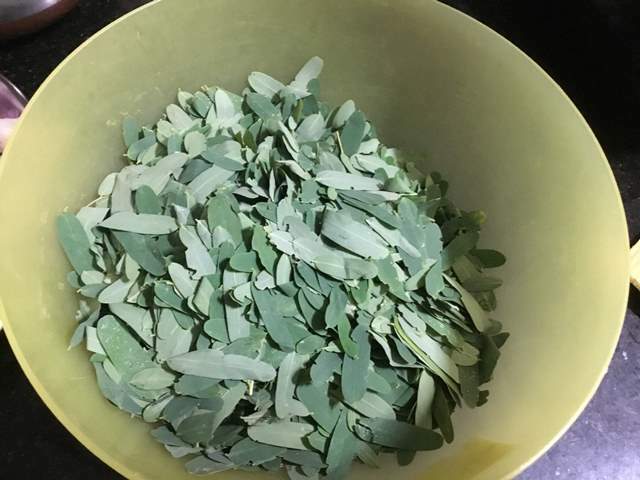 Next, add the required salt and mix them well with the leaves. Now add our magic ingredient powdered jaggery and mix it well. Add the ground coconut mixture and mix it well. The coconut paste must incorporate well with the leaves. 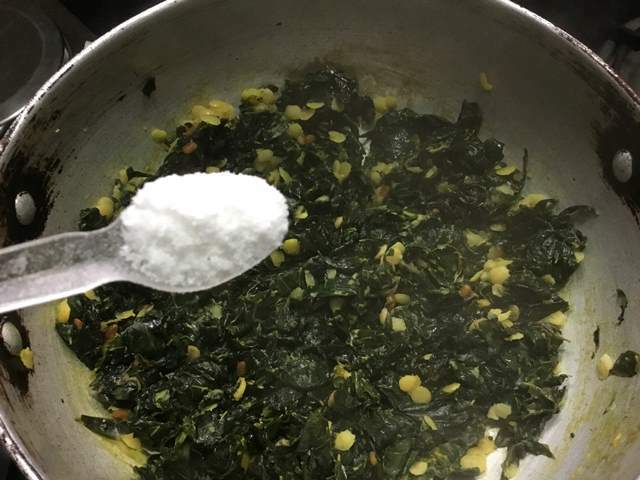 Finally, add the coconut oil and stir it well with the leaves. Turn off the heat and transfer the keerai to the serving dish. 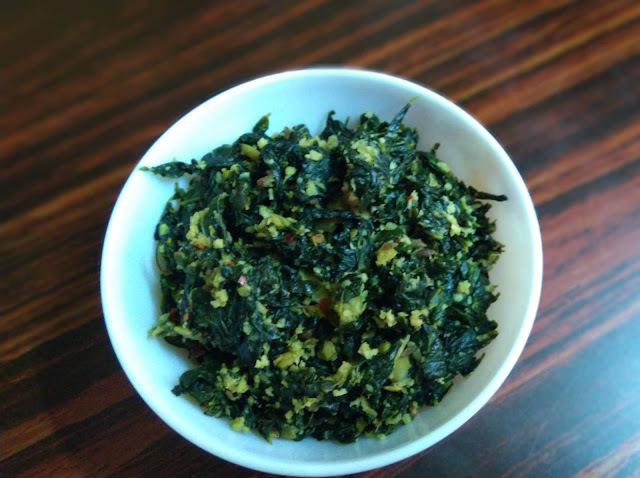 Serve it with sambar or pulikuzhambu.